Step 1 Place chicken legs, chicken stock and chopped lemon grass in a medium saucepan. Bring the stock to a gentle simmer over low heat. Poach the chicken for 30 to 40 minutes until cooked through. Remove from the stock and cool. Remove the skin and bones and shred the meat into bite-sized pieces. Step 2 While the chicken is cooking, stir together the yogurt, lime zest, lime juice and curry powder. Add the green onions, red pepper, celery, chopped cilantro and salt. Gently stir in the shredded chicken. Step 3Place the nan in a 350-degree oven on the rack and heat until warm but still flexible, 1 to 2 minutes. Do not allow it to crisp. Step 4Place each piece of nan on a plate and spoon one-half cup of chicken salad on top. Sprinkle with 1 tablespoon chopped peanuts and lay 2 sprigs cilantro on top, extending out the sides. Roll the nan around the filling. In Recipes-list.com we have selected the most viewed recipes from category - Healthy eating Sandwiches . Enjoy the best recipes specially selected for you! 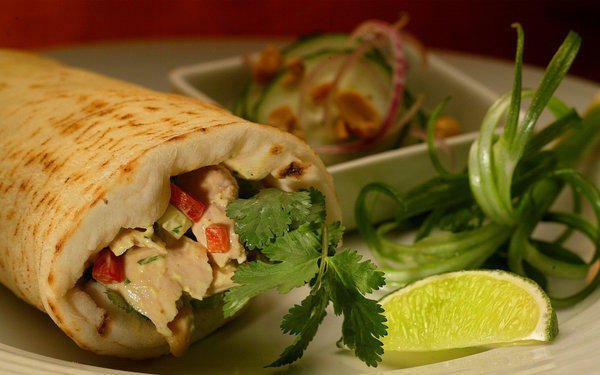 Curried chicken salad on nan is the right choice that will satisfy all your claims.